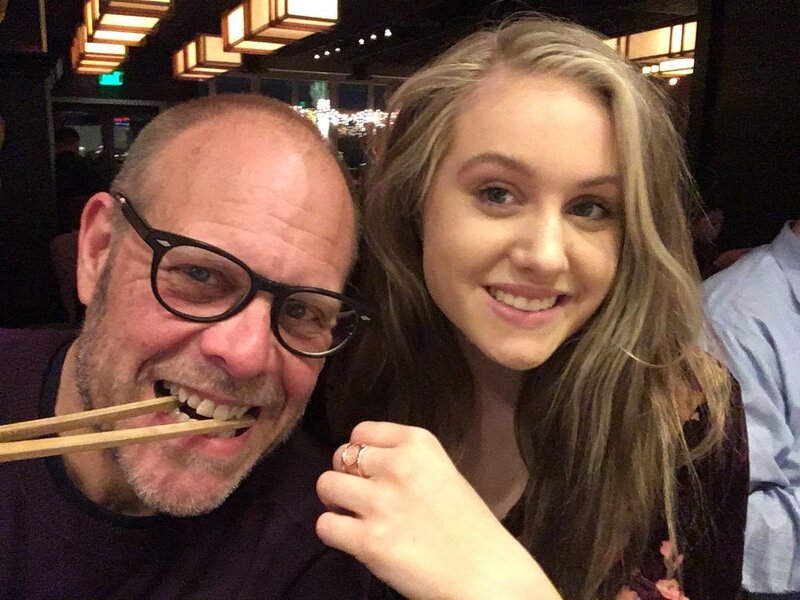 Alton Brown is one of the most influential American celebrity chefs, he garnered huge fame through his appearance on Food Network shows such as Iron Chef America, Feasting on Asphalt, and Good Eats, among others. An interesting fact about Brown is that he is multi-talented. He isn’t just a chef, he is also an actor, TV personality, cinematographer, and musician. Alton is also a prolific writer and has authored several cookbooks since his career hit the road. The celeb chef was born as Alton Crawford Brown on the 30th day of July 1962. He was raised by his father Alton Brown Sr. and his wife in Los Angeles. As a teenager, Alton spent most of his time in Georgia, where his father has a radio station called WRWH as well as White County Newspaper Publisher. Growing up, Alton completed his high school in Georgia and went further to study film at the University of Georgia, graduating in the early nineties. Soon after his graduation, Alton began his career in cinematography and film production. The talented star worked on the set of various music videos including R.E.M’s video for The One I Love. He was also credited as one of the producers of Spike Lee‘s film titled School Daze. After a few years of working behind the scenes, Alton developed a keen interest in the chef business. Meanwhile, he already expressed a huge amount of dissatisfaction from watching cooking shows on American television. This feeling led him to create his own show later on. Prior to the inception of his cooking show, Alton attended the New England Culinary Institute where he took classes on Culinary Arts, graduating in 1997. Upon graduation, Alton Brown began his own food show titled Good Eats. The show first aired on PBS in July 1998 before the Food Network picked it up the following year. The show ended after 14 seasons from July 1999 to February 2012. It earned an award nomination for the Best TV Food Journalism in 2000. Subsequently, the show got a Peabody Award in 2006. Alton also made other appearances on cooking shows such as Iron Chef America, Feasting on Asphalt, Cutthroat Kitchen, The Next Food Network Star, and The Layover along with Anthony Bourdain. Additionally, the chef began his own podcast titled The Alton Broadcast where he reviews recent food, interacts with listeners and answers their questions. He also interviews celebrities and other guests on the show. He released a music album titled Bitter Like Me in November 2016. Alton has authored several cookbooks for which he has been regarded as one of the best in the field. He has equally received a good number of awards for his excellent contributions. The famed chef has recorded massive successes in his career and acquired huge wealth for himself. Alton currently has an estimated net worth of $13 million. He earns his fortune from his cooking TV shows, his acting career as well as other endeavors. Notably, he is one of the best-selling cookbook authors of all time. Without a doubt, Alton Brown has proven to be one of the best chefs out there. His cooking style has inspired many upcoming chefs to know they can do better. While he has been successful in his career, the same can’t be said of his love life. Alton Brown has joined the list of celebrities whose relationships have gone up in flames. The media star was previously married to a lady named Deanna Brown who is a television show producer. Interestingly, Deanna has been the producer of her husband’s shows including Good Eats, among others. The pair met each other several years ago while Alton was working as a cinematographer. After a few years of a successful relationship, they sealed their love officially. Together, they have a daughter named Zoey Brown. The happy couple lived together for several years until 2014, when their relationship turned sour; thus, leading to a series of irreconcilable issues. The couple separated in 2014 and their divorce was finalized the following year. After their divorce, Alton Brown went on to start another relationship with a restaurant designer named Elizabeth Ingram. Elizabeth is originally from Atlanta; they announced their engagement in early 2018 and in September of the same year, they tied the knot. Their wedding took place on a boat in Charleston SC. Check Out: Who is Laci Green, Is She Still Dating Chris Ray Gun, What is Her Net Worth? Currently, his only child is in her teen years, Zoey has made several appearances on her dad’s shows.